Top 100 Golf Courses and Wegolf Argentina (www.wegolf.com.ar & www.wegolfargentina.com), Argentina’s leading Inbound and Outbound Golf Tour Operator, together present the new 2016 Top 30, expanding the list by ten more courses. We now feature the best 10% of the total courses in Argentina. Four years have passed since our last update and there are some well deserved new additions: Pueblo Estancia La Paz, La Estancia de Cafayate, Los Canales de Plottier, El Valle del Golf and Cañuelas Golf Club are five notable courses that we’ve added since our last update. All five are great courses located in some of the most breathtaking landscapes in the country. In its 2,800,000 km2 of land surface, Argentina has more than 300 courses and more are on the way, including new developments in Mendoza, San Juan (near the Racing Track, an RTJ II Design) and Córdoba, additionally some existing courses are undergoing some form of renovation. For example, the Blue Course at the Jockey Club will have a complete new irrigation system that will surely improve its current status. Argentina has become a more popular golfing destination in recent years, due not only to the success of our main golfers, Cabrera/Grillo/Romero/Gomez, but also thanks to genuine value for money. You can experience top quality courses with a very high standard of greens maintenance (many of the best run at 11-12 on the Stimp). You can build a complete vacation by including wonderful tourist experiences, great food and nighttime spectacles for a very affordable price. Following a recent visit to Argentina, Tom Doak provided a very good commentary (within the latest Confidential Guide to Golf Courses) of the great courses that you can play in the Gaucho’s land. Golf Digest ranked three of our top venues in the Top 100 outside the USA: Olivos Golf Club, Buenos Aires Golf Club (both co-hosts of 2010 World Amateur Championship) and Jockey Club (Red Course), designed by Alister MacKenzie. But one of our best courses, Chapelco Golf Club, is still not recognized by international publications, but why? Also Mar del Plata Golf Club, with its greens running at 13-14, and El Potrerillo, which was qualified by Doak as the best golf course in the country, are two other layouts that deserve the highest consideration by international media. Olivos (Blanca & Colorada) has a well-deserved first place, sometimes called the Augusta of South America. It has great design, challenge, stately trees and greens that during competition can be really tough. Although some greens were changed from the original Luther Koontz design, most of the course remains unchanged. It will host the 2016 Argentine Open for the PGA Tour Latin America. Buenos Aires Golf Club stays at No.2. Robert von Hagge designed this 27-hole facility and the club was honored to host the 2000 EMC World Cup, which was won by Tiger Woods and David Duval (No.1 & 2 in the world at that moment). The course is a typical American design, with variety, challenge and huge greens with a lot of movement that can provide numerous different pin positions. 3rd position goes to El Potrerillo, which is very well deserved. It’s routed over a fantastic piece of land, where the presence of its historic Jesuit building and lovely touches by local architects Caprile & Capdepont make this course a true jewel that can be played almost all year long due to an ideal climate. Chapelco goes from 1 to 4 and this is because raters finally got to play the top three over the last four years and most agree they are the better courses, although maybe not as scenic. All the same, Chapelco is a must-play course and now that there are nine holes ready at nearby El Desafío this destination has moved to a higher level. Those who also love fly-fishing will be in paradise here in Patagonia where you can combine the best fishing with great golf. Jockey Club (Red) maintains its previous 5th position. It’s our most renowned course and the one every visitor wishes to play. Designed during Alister MacKenzie’s world trip when he also fashioned Club de Golf Del Uruguay, Club de Golf Los Leones (Chile) and Royal Melbourne among others. 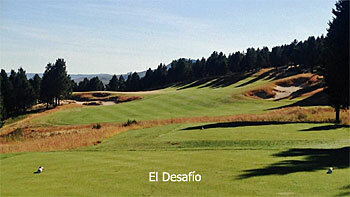 “La Colorada” offers challenge on a big scale with narrow fairways and inverted dish-shaped greens. It usually hosts the Argentine Open (last time in 2015) and hosted the event in 2001 when our championship was part of the European Tour, which Angel Cabrera won. Inside the Top 20 there are new additions such as Cañuelas Golf Club, El Desafío, Los Canales de Plottier, El Valle del Golf, Pueblo Estancia La Paz and Hurlingham. For those who like to study golf course design, you will find some very interesting greensites in Argentina (12th at Golf Club Argentino, 14th at Hurlingham, 17th at Mar del Plata, 17th at Jockey Club Red, 15th at San Isidro and 12th at Cañuelas). There are some world-class holes too, such as the 7th at El Desafío, 6th at Potrerillo and the 11th at Chapelco to name just three. Maybe it is time to visit Argentina and experience what used to be a hidden golfing destination but now is perhaps the true gem of Latin America. We all know that Maradona, Messi, Fangio and Tango are a few Argentine sporting icons, but golf is something we are also very proud of. With a great variety of courses in the country’s best tourist locations, we feel that a golf holiday in Argentina will never be forgotten. During the second week of March we host the Argentina Invitational (www.argentinainvitational.com), which is our promotional event. More than 400 golfers have played in the first six editions. Maybe it is time for you to come and join us and experience some of our amazing venues. Jockey Club (Red) will be the opening round in the 2016 edition next month. To see our new 2016 Argentina Top 30 in detail, click the link.